Literally meaning "east of the mountains", Shandong, or Lu for short, links East China to North China, to the Bohai Ring Economic Area and the Yellow River Economic Belt, and holds an important role in China's economy. The gargantuan Yellow River, the second longest river in China, empties out into the Yellow Sea in Shandong province, after its trek through the Tibet-Qinghai Plateau. Over 100 smaller rivers and lakes run through the province, creating a thick traffic of waterways. Central Shandong is mountainous, while its south and east are hilly. The north is flat, part of the North China Plain. Shandong has a warm monsoonal climate, with dry bright winters and wet, hot summers. This region has an awesome authenticity that makes it one of China's most visited provinces, as well as one of the most populated. Much of this is due to its dramatic and colourful history. It was home to many famous Chinese great men, such as the philosopher Confucius, and the calligrapher Wang Xizhi, whose presence help contribute to many of Shandong's historical sites. But there are also numerous beautiful scenic sites. Getting around Shandong to see these sites is easy, as it has a dense transportation network with good railways. 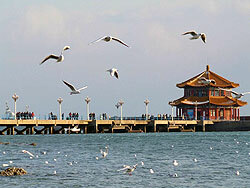 Shandong's capital, Jinan, the famous coastal "Spring City", was host to the 2008 Olympics Sailing Regatta. Jinan is a key city in China's push to open itself to the world. The people of Shandong are known for their forthrightness and honesty. Their salty and wholesome cuisine, too, is devoid of fancy frills.